Almost four months after they were first introduced to the world, the Samsung Galaxy Tab 2 have finally arrived in our shores. Available in two different sizes – 7.0 and 10.1 inch – they are touted as Samsung’s first Android 4.0 Ice Cream Sandwich tablets. Just like what we wrote back in February, both tablets actually have a lot in common such as 1.0GHz dual-core processor, 1GB of RAM, 3-megapixels main camera and VGA front-facing camera. However, you can’t simply ignore the differences though since their sizes are significantly different from each other together with the fact that Galaxy Tab 2 10.1 comes with a higher resolution display at 1280×800 and a larger capacity battery at 7,000mAh. That being said, the 7-inch edition of Galaxy Tab 2 also boasts a feature that is not available on the 10.1-inch version: a proximity sensor that automatically turns the tablet’s display when a user makes a call. 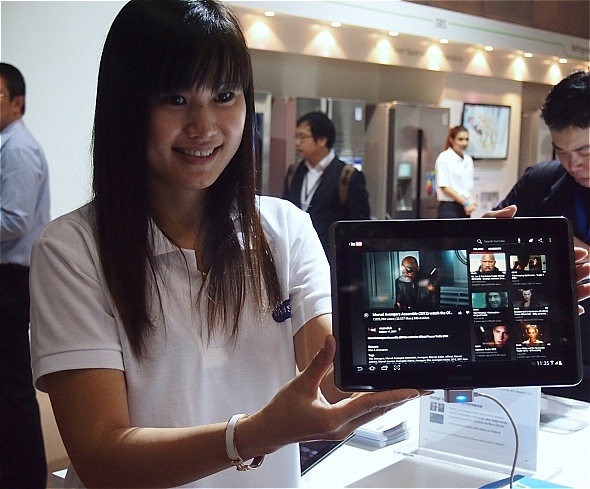 Available with 16GB worth of internal storage and 3G connectivity, the new Samsung Galaxy Tab 2 Series are available in Malaysia from this month onwards with a price tag of RM 1,299 for the 7-inch edition and RM 1,499 for 10.1-inch. You can learn more about the new tablets through our hands-on experience at the Samsung SEA Forum 2012 that took place earlier this year or alternatively, visit www.samsung.com/my.